This is a revised (shortened) version of the original post, which included a long section from the lawn-care article mentioned below. For that article in its original context, click here for the weed page and scroll down for kudzu. kudzu on the march– photo from the Coalition. The endless lawn article (Hey—how’d that work as a movie title? The Endless Lawn Article. You know, as a sequel to The Endless Story? No?) included a section on weeds, of course, and it occurred to me to wonder if the most famous weed of all, kudzu, was a problem in lawns. So I started googling away, and found things that made it hard to sleep at night. 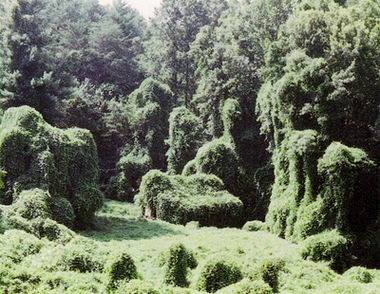 I swear, kudzu is the stuff of nightmares and really bad science fiction movies, but it’s real. It’s a leguminous vine—yes, it’s cousin to your beans and peas, and brother to soy beans—but unlike any of those, it can grow several feet per week, enveloping entire trees, which it kills by depriving them of light and water. It looks most spectacular when draped over a thirty-foot-tall tree, but left unchecked, it will take over whatever is in its way, including, yes, your lawn. One of the first sites I found swiftly became my favorite. This was maintained by The Coalition To Control Kudzu Without Chemicals, a grass-roots group based in Spartanburg, South Carolina, whose kudzu-control efforts apparently started when they discovered cherry trees disappearing under vines several springs back. The site isn't perfect–there's no forewarning about which menu items are PDF files and which are page links, and I just itch to get my busy-body editorial fingers on some of the writing–but there's an enormous amount of information in there, along with that invaluable item, a sense of humor. This bunch of volunteers has pioneered a number of control methods, which they test and document at their experimental site, and they’re out there every day in summer armed with various implements of destruction, battling it out with these behemoths. Their site has terrific and sometimes quite funny photographs that bring you face to face with the enormity of this task—and of these vines. Check it out. Ack! Gack!!! Kudzu! We live in terror of its appearance here in scenic PA. (But I guess any excuse to get a couple of goats is a good excuse.) Great post, Kate!!! wow, I didn’t know it was in the west as well. spooky. Your description of the coalition reminds me of similar grassroot groups around Portland battling Himalayan Blackberries as well as exotic invasive ivy (can’t remember the variety). After a day of helping I remember sitting on a log, being unable to move my hands. Your last comment was what I was thinking all the way through. Hmm a fast growing legume. It must be compost heaven. I just did a quick Google on kudzu and came up with two uses that I thought were intriguing: it’s used as a cure for alcoholism (apparently) and it’s starchy enough to be a good biofuel. Hey, has anyone told Dubya about this? It sounds like his kind of plant. Wow, Michãel. That’s tired. I’ve heard about the blackberry problem. 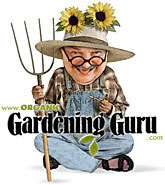 How did you end up out there weeding? I didn’t think you ever lived there– Did you go specifically to weed? I suggested to Newt (the Coalition guy who helped me so much) that his town host a Kudzu Festival with teams and prizes and all sorts of nonesense. Right on, Daphne. Newt says he’s had problems with tomatoes planted in pure kudzu compost, though. Don’t know why. They’ve got blossem end rot despite his dosing them with every calcium source known to man or gardener. Victoria, I thought of the bio-fuel use too, and have seen mention of it. Something like that is almost the only thing I can think of that would induce the government to actually do anything about this problem. Wow, I can tell I’m still tired from yesterday’s hike; that was nearly incoherent. I’ve seen but not followed up on the alcoholism stuff; I should add these to the actual article, though, because they’re varied, timely, and interesting. Thanks for reminding me of them. 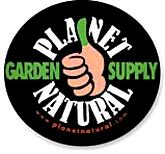 The world record tomato grower in Alabama uses Kudzu compost and he got 450lb of tomatoes on each of four plants. He has written a book about it all, so you may find one use in that. Compost may be the one use for kudzu,Rhys. I’ve read Charles Wilbur’s book; it’s great fun. Thanks for sharing this! I am all about organic control and this stuff is taking over!